After suffering a devastating leg injury that left him in a wheelchair, Ivan Little celebrates the unsung professionals who have helped him to walk again. They’re the unsung heroes in the relentless and challenging battle to help thousands of people here with their rehabilitation in the wake of a remarkably long and diverse range of injuries, illnesses and disabilities. And while doctors and nurses are the high-profile figures on the frontline of the NHS, physiotherapists often work unheralded in the background of the healing game. The very mention of their profession and their unfair reputation for inflicting pain can strike fear into grown men and women, so much so that they’re mockingly referred to in some quarters as physio-terrorists. 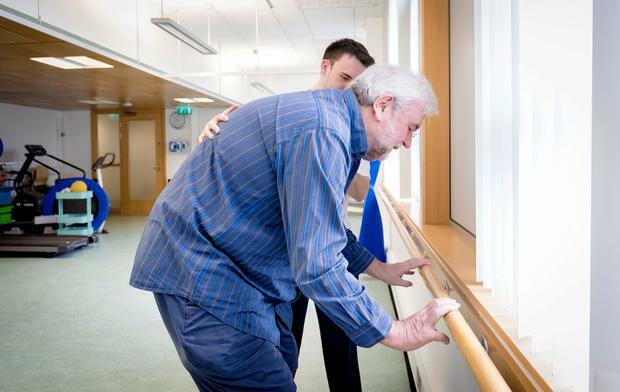 But the vital work of physios like Darragh O’Neill is seldom fully acknowledged, even though what they do can assist patients with all sorts of serious issues like shattered limbs and neurological, heart and respiratory problems. Yet while most people will routinely come face to face with a doctor or a nurse at some point in their lives, many of them can go through their days without ever encountering a physio. And that’s where I have to stand up and be counted. For without physios and a surgeon skilled in putting together fractured bones and torn tendons at the Royal Victoria Hospital in Belfast, I mightn’t be standing at all. A year ago today (October 23) I slipped and fell in Belfast on a railway footbridge and agonisingly ruptured the quadriceps tendon in my right leg. It happened in an instant. The recovery didn’t. An emergency operation re-connected the tendon and at one of my reviews the surgeon asked me to lift the leg he’d repaired. And when I managed to raise it off the bed, he told me that his work was done and that I was now in the hands of physiotherapy. A protracted housebound period in a straight leg cast followed, before my wife who was my carer and who for months undertook everything for me, including daily bed-baths, pushed me in my wheelchair for my first physio appointment. It really was a journey into the unknown. Darragh O’Neill was my first NHS physio and his task was to get me back on my feet. Right from the start he was honest. He told me he’d never personally encountered a total rupture of the quadriceps tendon. It was that rare an injury. But Darragh assured me he’d investigated it thoroughly and consulted in depth about my treatment with colleagues. He also warned me that the rehabilitation could take over a year. What quickly became clear to me was that there’s a lot more to physiotherapy than ice packs, manipulation and massages. Darragh trained on an intensive three-year course at the Ulster University studying anatomy and physiology at Jordanstown before undertaking six clinical placements lasting six weeks at a time. And for Darragh the degree course wasn’t all about learning hands-on skills. “The training wasn’t just about the practice of physiotherapy. There’s the overall picture of health, too. And we also do interview practice to focus on interpersonal and communication skills,” says Darragh. He believes that communication is a crucial element in encouraging people to understand what physios like him are striving to achieve. “Listening is important, too. You have to hear what people are saying to you,” he says. My mood swings were horrendous and Darragh was as much a psychologist as a physiotherapist, trying to assure me that the darkest days would brighten up. And he constantly urged me to focus on the progress and not the pain as I went from a straight leg brace to a wheelchair to two crutches to one crutch to unassisted wobbling, to a limp. Darragh started working for the Belfast Health and Social Care Trust two months after he graduated, with his first posting in the City Hospital where he concentrated mainly on respiratory issues in post-op surgery, intensive care and general medical wards. The next six months still centred on respiratory patients but this time in the community where home visits are generally acknowledged as presenting a different set of challenges for physiotherapists. Darragh’s next placement was in the Knockbreda Wellbeing and Treatment Centre where I saw him. The majority of patients he encountered there had musculoskeletal disorders, problems with muscles, tendons, bones or joints. The work ranged from helping people with, for example, chronic back pain to those in need of acute rehabilitation like me. “Every day presents a new learning experience,” says Darragh. “No amount of university prepares you for everything that is going to come through the door. You just have to have the drive to learn about it for the good of the patients. 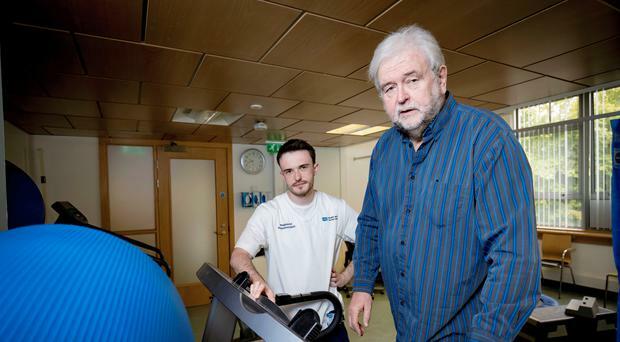 Darragh has helped to set up a special exercise class for people with lower limb injuries and he says patients who have a positive mental attitude are easier to treat than others. He knows that some people view physios with dread — he’s heard all about physio-terrorists but dismisses the notion. He says: “The perception of physiotherapy is that it’s really hard work and that you’re going to be really sore after a session. But pain with exercise isn’t bad. “It’s not damaging sore. It’s the muscles repairing themselves, healing themselves and making themselves stronger. Yes, it’s tough but what you put in, you get out. In my case Darragh implemented a thrice-daily home-exercise programme of leg stretches and, in Knockbreda, he had me on a treadmill and exercise bike long before I imagined it would be possible. The small steps were the biggest ones. Climbing the aforementioned stairs was a Dawson Stelfox moment — for months on end I slept downstairs in a hastily reconfigured dining room. Getting my socks on all by myself for the first time had me in tears and I proudly rang friends and relatives to tell them about my achievement. 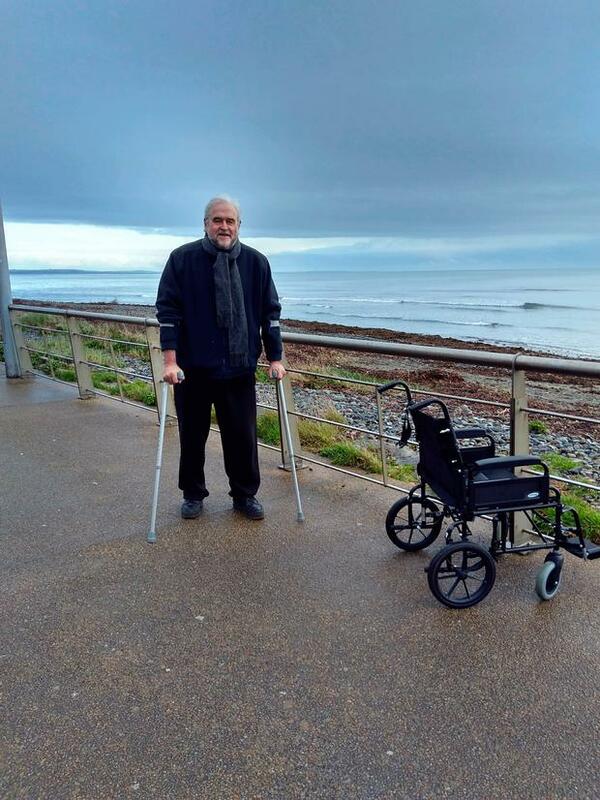 My first walk out of the wheelchair on my crutches along Newcastle’s promenade was another watery-eyed watershed and the first stagger without any crutches along Portrush’s West Strand was a Neil Armstrong like triumph. Driving for the first time after six months was nerve-wracking. But the confidence came back after a few test drives around empty car parks. Darragh O’Neill says he gets a lot from his job which has now taken him to work in neurosciences in the Royal Victoria Hospital where he deals with people who have had operations for brain and spinal tumours and the like. Another physiotherapist, Enda Mullan, later stepped into Darragh’s shoes with my rehab. And while Darragh essentially taught me how to walk again, Enda concentrated on strengthening my leg and improving my balance, which has proved unexpectedly difficult to regain. At the Holywood Arches health centre, Enda had me undertaking exercises including what were initially difficult lunges and squats. He stood beside me ready to catch me when I attempted to stand on one leg. He also encouraged me to walk up and down stairs. I found the former just a little easier than the latter. And it was only after I mastered the downward route — albeit slowly — that he was in a position to discharge me from my physiotherapy visits, though he urged me to keep up the exercise regime, which I still do. Enda says jobs were at first scarce after he graduated as a physio and after spells in New Zealand and England he was happy to get a post with the NHS in Belfast. “And I enjoy what I do,” he says. “I find it really satisfying to help make people better and to have an impact on improving their quality of life. “Physiotherapy isn’t just about pain relief as it might have been in years gone by. Deirdre Winters is an assistant physiotherapy manager in Belfast, heading up more than 100 physios in a number of different teams. She says: “The rehabilitation programme can be a long process. And different people need different types of treatment at different times. “The recovery also depends on a level of trust between the physiotherapist and the patient. Waiting lists for NHS physiotherapy can be lengthy. One man diagnosed last week with ligament problems by his GP has been told he could have to wait six weeks for an appointment after he is referred for physio. Others with more minor problems may have to wait months. East Belfast GP Dr John Kyle says doctors find the referral system frustrating. “Referral is fairly simple and straight forward for GPs as it’s done electronically,” he says. “The only problem is we do it blind and by that I mean we don’t know how long a patient will have to wait. The waiting list probably fluctuates quite a lot over the course of a year. “But some problems really need to be seen quite quickly and there is little point in referring the patient if they are going to have to wait 16 weeks for an appointment. “Physio does work better for injuries rather than long-standing chronic conditions, hence the need to be seen fairly quickly. People who want more immediate attention are turning increasingly to private physios like former Irish League footballer Brian Strain whose One2One practice is on Belfast’s Cregagh Road. Brian, who used to work with the NHS and who is also a physio with Crusaders FC, says the private sector has grown massively in recent years. “There are probably up to 10 private practices within a two or three mile radius of me for example,” he says. A number of GPs are now informally referring their patients to private practices. As for me, I still have a limp, I still have to negotiate stairs gingerly and I am still in pain from time to time — but compared to other people who are suffering from illnesses, my life is a comparative walk in the park.